I don't know who you are, but I do know you are at least two inches shorter than I am. "That wouldn't be hard," you might say, if you knew that I am six foot four inches tall. I never published my research, but now Cambridge University has offered me a chance to make my discoveries known to the world - although not yet! 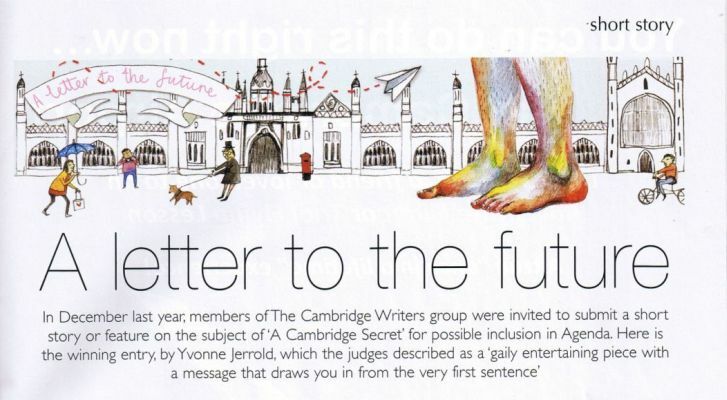 This year, as part of its 800th anniversary celebrations, the University has invited the people of Cambridge to write 'Letters to the Future' which will be locked away for a hundred years before being opened. Does all this sound like a fairy story? Well, I admit, I do look a bit like a mad scientist with my white hair and my tendency to wave my hands about but, believe me, my legacy to you and to the world is no fairy story. Rather, it is the single most important step taken by humankind this century, to lighten our footprint on the earth - literally - and reduce the damage we are doing to our planet. I have not published my research because I know the only way it can benefit mankind is for me to implement it in secret, otherwise its progress would be blocked by ethical, moral and religious objections, as well as by all the common prejudices about the benefits of height. Because, you see, in this century there is a huge preference in favour of people being tall. Tallness is associated with success and good health and beauty and I can see no prospect of persuading people otherwise in time to save the planet. By then, too, the contents of this letter may be dismissed as the ramblings of a long dead giant in a fairy story. Will anyone believe it? I wonder.